"I made up my mind in five minutes. I thought about all these kids are missing — sports teams, proms, everything in such disarray, and I wanted to go help." Monica LeRossignol and her son are still stunned by the freshly printed $1,000 check, a gesture that's brightened the difficult, surreal reality of rebuilding their lives after losing their home and most of their community in Paradise, California. 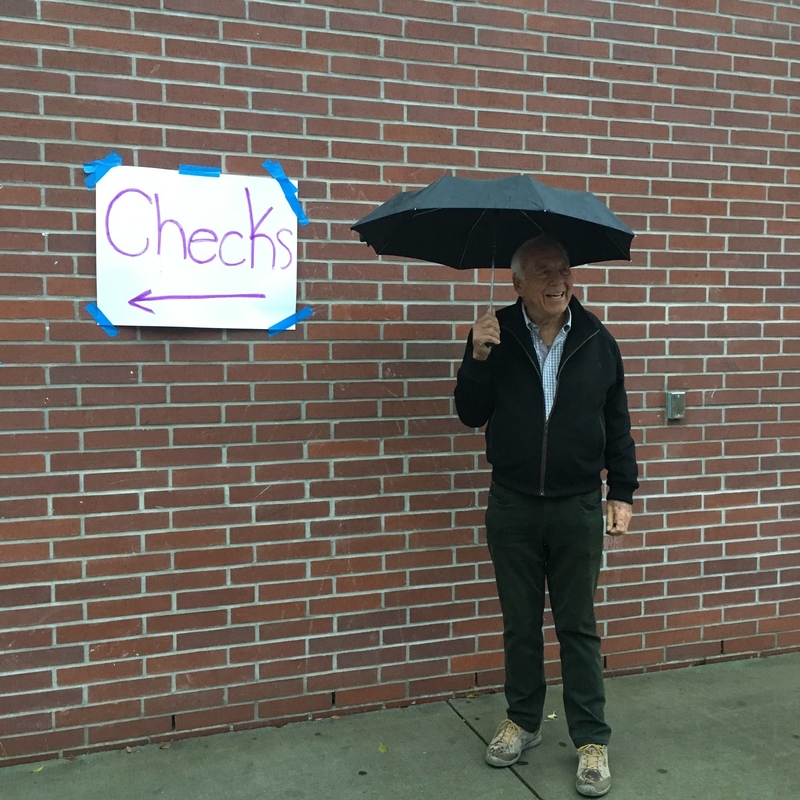 On Tuesday night, her 17-year-old son, Trevor LeRossignol, and hundreds of other students, parents, and faculty members from Paradise High School gathered at Chico High School, as they have every week since the Camp fire leveled their town, to catch up, give hugs, rifle through donations, and eat some warm food. But this gathering had a major bonus. 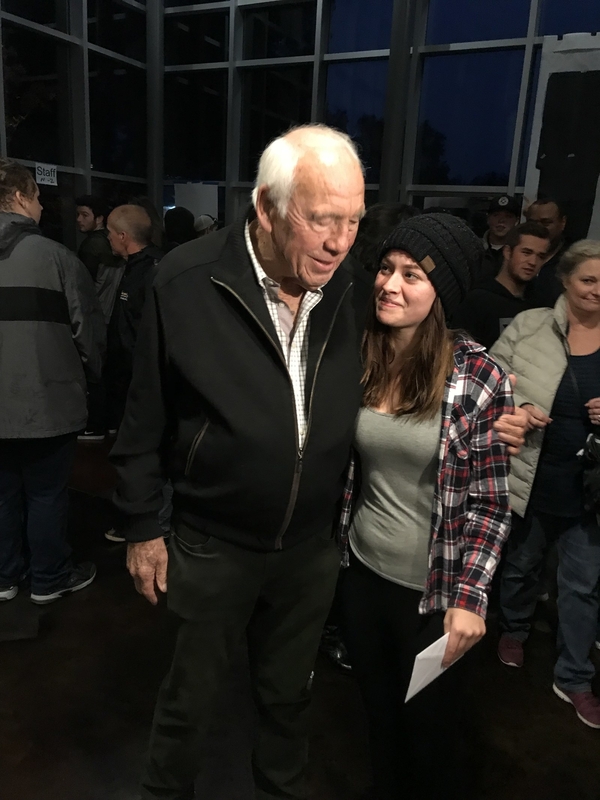 Bob Wilson, a Southern California real estate developer, was there giving out $1,000 to each of Paradise High School's 982 students and 105 employees, totaling about $1.1 million in donations. "I gave him a hug," LeRossignol said. "He's a very generous and compassionate man. We talked a bit about how Trevor and his friends were going to continue to be Bobcats and graduate from Paradise, somehow." Like thousands of others, the 46-year-old lost everything in the catastrophic wildfire, which has killed 88 people, torched more than 153,000 acres, and destroyed 14,000 homes. 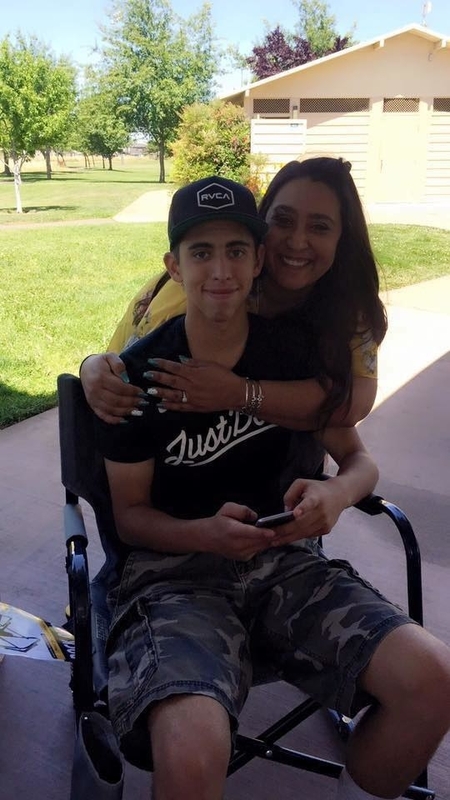 The mother, her son, fiancé, two nephews, and six other family members fled for their lives and are now crammed into two bedrooms at a friend's house in the nearby city of Chico, but "it's only temporary." A few weeks earlier, as the Camp fire continued to burn around Paradise, Wilson came across a story in the Los Angeles Times about the students of Paradise, most of whom lost their homes. It delved into the uncertainty facing Paradise Unified School District and its class of seniors who were readying to graduate. 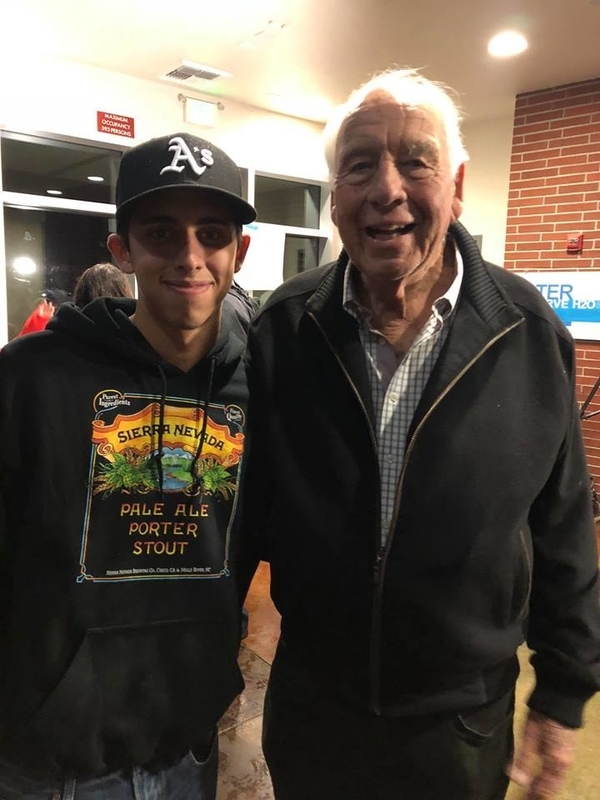 The 89-year-old told BuzzFeed News that Paradise High School's plight stuck with him, reminding him of his own "carefree" days as a teenager. He realized that many of these students, who are now scattered across the county and state, have lost not only their homes, but their sense of security and routine: their friend groups, sports teams, favorite teachers, and school dances. "I made up my mind in five minutes," the businessman said Wednesday morning from Chico. "I had some of the most profound experiences in my life in high school because I was still able to be a kid, and it broke my heart to think of the experiences these kids were missing." So he called up Paradise High Principal Loren Lighthall, who is also trying to figure out where he and his wife, six children, and dog are going to live now that their home has been reduced to ash, and asked how he could help. 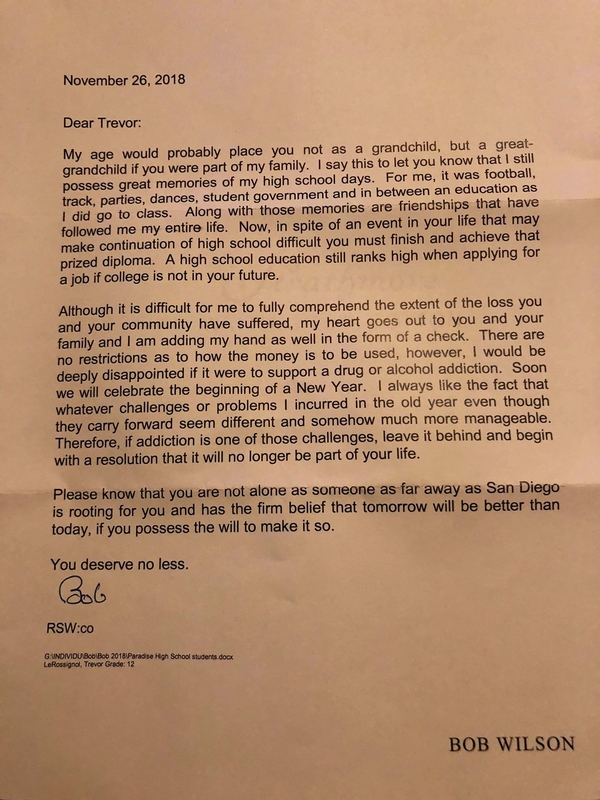 About two weeks later, Wilson was flitting between about 10 tables set up inside Chico High's hallways, handing out envelopes containing a letter and personal check addressed to each student, teacher, and custodian, which he had personally stuffed from one of his offices in Los Angeles. Please know that you are not alone as someone as far away as San Diego is rooting for you and has the firm belief that tomorrow will be better than today, if you possess the will to make it so. You deserve no less. "It was a really unique, cool way to give," Lighthall said of Wilson's donation. "It's been rough, especially for high schoolers who need their friends and there's no way to get together. These gatherings provide an avenue." Two days after the fire tore through their close-knit, rural California town, Lighthall, who has been principal for two years, started a GoFundMe for Paradise High, a "high-poverty" school where 67% of students qualified for free lunch last year. Almost every one of the nearly 1,000 students lost their home and "everything they own," he said. From left: California Gov. Jerry Brown, FEMA Administrator Brock Long, and Interior Secretary Ryan Zinke tour a school burned by the Camp fire. Their high school's future is also uncertain. Although the campus survived the fire, it's now standing in a town full of rubble, ash, and hazardous materials. Crews are still combing properties looking for the remains of missing residents. "No one wants to go to a new high school," Lighthall sighed. "But even if we could go back tomorrow, no one is living there, and it's an hour drive for many to get there. It's not feasible." After nearly a month in limbo, Paradise students will go back to class on Dec. 3, but the elementary students will be bussed to other towns. Middle and high schoolers will be studying in "drop-in labs" at the Chico Mall, the district said Monday. Officials hope to have a "long-term" solution by Jan. 7. For now, Lighthall explained that their main goal is getting the kids their credits however they can. While scoping out alternative spaces for Paradise High's new home, the principal also said goodbye to his wife and five of his children, who moved to Idaho to live with family so their younger ones could regain some sense of normalcy. His eldest son, a senior, is staying with him. "The last thing I want to do is split us up and be alone," he said. "But this is everyone's new normal. You wake up in a strange bed in a strange place with not many possessions and not a lot of contact with people you care about and get through it." That's why moments like Tuesday night are so important, LeRossignol said: They bring those now scattered back together in a simple, but comforting way. "I'm trying to make this all as normal as possible for [Trevor]," his mother said. "He's being strong, but my biggest worry is finding a home for my family and him not graduating as a Bobcat with his friends." She says her son might use his new cash to "replace a few things that he lost," or buy new tires for his truck. "And of course he said he is going to buy me something," she said with a laugh.